What is the Success Rate of Dental Implants? Dental implants offer a number of advantages over traditional dentures. By eliminating slippage along the gum line, gum irritation, problems with fit, and messy adhesives, dental implants have greatly improved the overall quality of life for many of our patients here at the Fawcett Center for Dentistry. 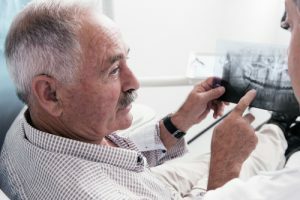 To determine your candidacy for dental implants, we will perform a comprehensive oral exam, review your medical history, and discuss your individual goals. Ideal dental implant candidates will have sufficient jawbone density to receive and hold the implant. The key to the success of dental implants is the stability provided by a small titanium post that acts as an artificial tooth root. After this titanium post is implanted into the gums, it will gradually become fused to the jawbone and can offer unparalleled stability. The success rate varies for dental implants based on a number of factors, but it is generally reported to be up to about 98%. Your dental implants can last a lifetime, provided you maintain proper oral hygiene. Since dental implants are designed to look, act, and feel just like normal teeth, no special care is required. To maximize the lifespan of your dental implants, routine brushing and flossing, as well as twice-annual dental checkups, is strongly recommended. If you would like to learn more about dental implants, or to schedule a consultation, please contact our practice today. Previous Post: Are Dental Implants Painful? Next Post: What If I Don’t Have Enough Bone for Dental Implants? ® The swirl background design is a registered trademark of Wayde Fawcett, DDS.